Kidpower’s core safety and self-advocacy skills can all be adapted to use the strengths and abilities of each person to keep themselves safe and get help. Every student in Kidpower is unique, and adaptation is at the heart of our work for everyone. Kidpower instructors explore what people can do rather than focusing on what they cannot do. We have learned that it is crucial to avoid making assumptions based on how our students seem when we start. It is too easy to think that a young person who has a physical disability or a developmental delay is helpless. 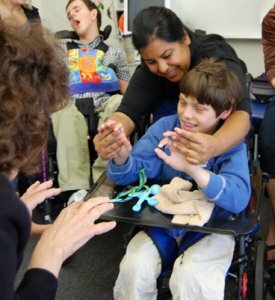 Often children and youth with disabilities have triggers about learning new things. They might believe that they are helpless themselves and act in ways that make them seem much less capable than they actually are. Sometimes the people who know them the best will underestimate their ability to understand and to learn and are even surprised that their students can say “No” or “Stop” or “Help” appropriately. Our instructors begin working with what our students show that they are able to do and then build a bridge from there, adapting to make the skill work for the student rather than trying to force the student to fit the skill. We look for possibilities and growth rather than focusing on limitations. If our students can’t see: We talk them through what they will be doing instead of showing them visually, or we get their permission to move their bodies to help them understand. We use language like, “show that you notice by turning your head” rather than telling them to “look.” We focus on using their hearing to notice problems. If our students have trouble talking: We work with whatever communication devices they have available. We practice how they can use cards that explain to others what the problem is. We work with all the ways of communicating available to them. If our students use a wheelchair: We say to “sit tall” instead of “stand tall” and practice skills sitting down. We show and practice Roll Away Power from potential safety problems instead of Walk Away Power. If we are teaching self-defense, we show Wheelchair Power, where they can use their wheelchair as a weapon to escape from an attack. If our students have trouble hearing: We work with their communication devises or sign language interpreters and focus on having them use their sight to notice trouble. We have them sign, use written captions, draw, or act out skills vividly without speaking. If our students can’t move one part of their bodies: We change show how using other parts of their bodies or even just their imaginations can make the skills work. For example, we have a one-handed Trash Can for waving away hurting words if a two-handed trash can won’t work. If Mouth Closed Power to stop yourself from being safe with your mouth won’t work because a student cannot close her or his mouth, then we change the name to “Mouth Safe” Power. If our students have difficulty understanding concepts: We keep our language very simple. We show them pictures or act out demonstrations of very concrete examples in situations that are familiar to them. 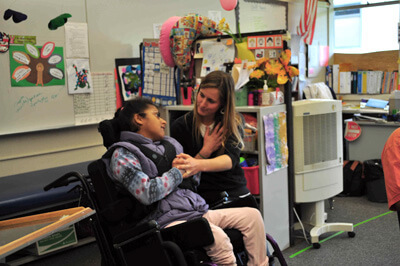 If our students can’t move or speak: We have the people who help them practice the skills for them, just as they help to meet their other needs. If our students have trouble being safe with their emotions: We teach them and their adults how to use Calm Down Power and other tools for managing their triggers. Use our “Bill of Rights” to empower people with disabilities (and their caregivers – and anyone else!) with these 10 “Rights” to be safe from abuse, bullying, harassment, violence, prejudice, and other maltreatment – and to develop safe and strong relationships that enrich their lives. 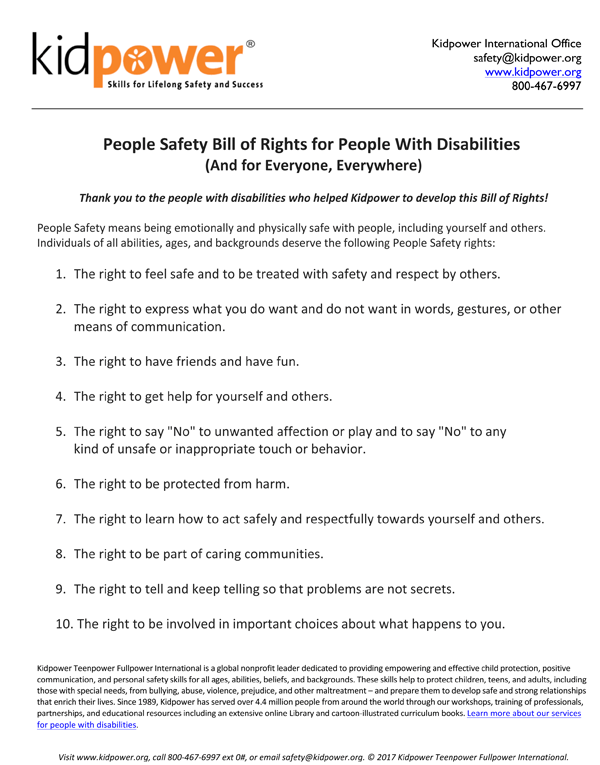 Enter your name and email address below to download this 1-page People Safety Bill of Rights handout for free – then check your email inbox (or your spam folder) for the secure download link! People of all ages with disabilities or other special needs are especially vulnerable to risks of bullying, abuse, prejudice, violence, and other maltreatment. Thanks to the involvement and expertise of many people with disabilities and their advocates, Kidpower services and resources have helped to protect the personal safety of hundreds of thousands of children, teens, and adults with special needs. The difficult life challenges these individuals face include having developmental and intellectual disabilities; having sensory impairments with their sight, vision, or other senses; having mobility impairments; being on the autism spectrum; or having mental health issues, often from past trauma. What skills do we teach for people with disabilities? 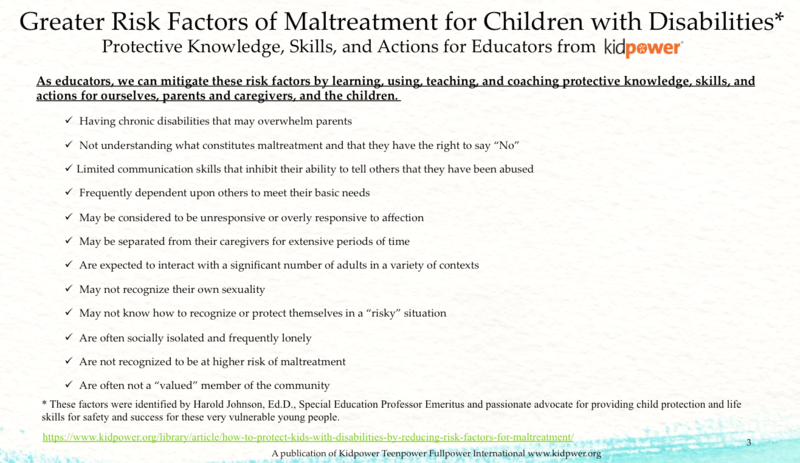 What do professionals say about Kidpower skills for people with disabilities? What training and educational resources are available? Practicing how to set boundaries. Learning effective physical self-defense skills without being able to see the target or while seated in a wheelchair. We work with participants and their supporters to identify their strengths and then to work with those strengths to stay safe. Thousands of students of all cognitive and physical abilities have found our services to be relevant, interesting, and well-suited for their own ways of moving, thinking, perceiving, and communicating. 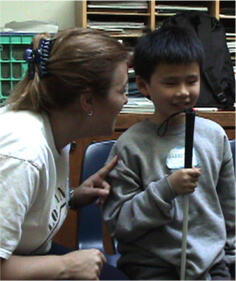 We provide prevention education and resource materials for teaching social safety and protection skills to people with disabilities of all ages. We work with students in special education programs and participants in organizations serving people with disabilities as well as educators, health care providers, mental health professionals, public safety officials, youth group leaders, and parents from around the world including Romania, Brazil, Guatemala, Mexico, Chile, Nigeria, Vietnam, Singapore, Australia, New Zealand, Pakistan, India, Canada, the UK, France, the Netherlands, Sweden, and the US. People report great benefits about how the Kidpower curriculum and training methods have helped them to protect and empower the children, teens, and adults with special needs in their personal and professional lives. 1. In locations where we have Kidpower instructors, we provide training of professionals, parents, and students in schools and organizations serving young people with disabilities. 2. 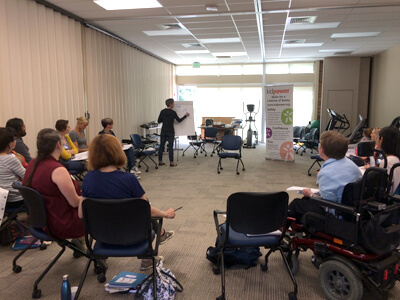 Our three-day Kidpower Skills for Child Protection Advocates Institute provides an in-depth opportunity to learn and practice Kidpower’s intervention, advocacy, and social safety skills and to apply these to support young people of all abilities in your family, school, and organization. Curriculum Teaching Books provide step-by-step lessons that students of all ages and abilities have found to be important, respectful, and relevant. 6. Consider joining Kidpower for International Child Protection Month to honor, inspire,and support adult leadership in keeping kids of all abilities safe from harm and empowering them with skills for take charge of their well being. We provide important free online resources you can use and share during September and throughout the year. 7. If you don’t have a Kidpower center or trained instructor close to your community, consider setting up a new one and training as an instructor. We also train teachers and other professionals to include Social Safety Skills in their programs and schools so that people everywhere can learn how to protect their emotional and physical safety. I work with families raising children who are deaf or hard of hearing and who face higher rates of victimization than typically-hearing kids.. Through our partnership with Kidpower, we now share information with each new family we meet about prevention strategies they can use with babies to teens. I can’t recommend this organization enough in its wise and calm approach to helping all kids develop the life-long ability to set boundaries, to listen to their own intuition, and to put safety first. Our parents say they are grateful for Kidpower’s resources, and so are we.